Enter the initials or name you would like engraved here. Are you looking for unique gift ideas for men, gifts for a boyfriend, or a gift for him, then check out this wooden docking station that makes a great personalized men’s gift that serves as a docking station, desk organizer and personalized wood valet to get him organized! This universal docking station can charge any phone including any IPhone, Samsung, and android with any phone cord. It also makes a great father’s day gift, gift for dad, anniversary gift for him or a gift for a boyfriend. This all in one docking station valet is a great way to get the man in your life organized. I designed it to hold all his personal everyday items. 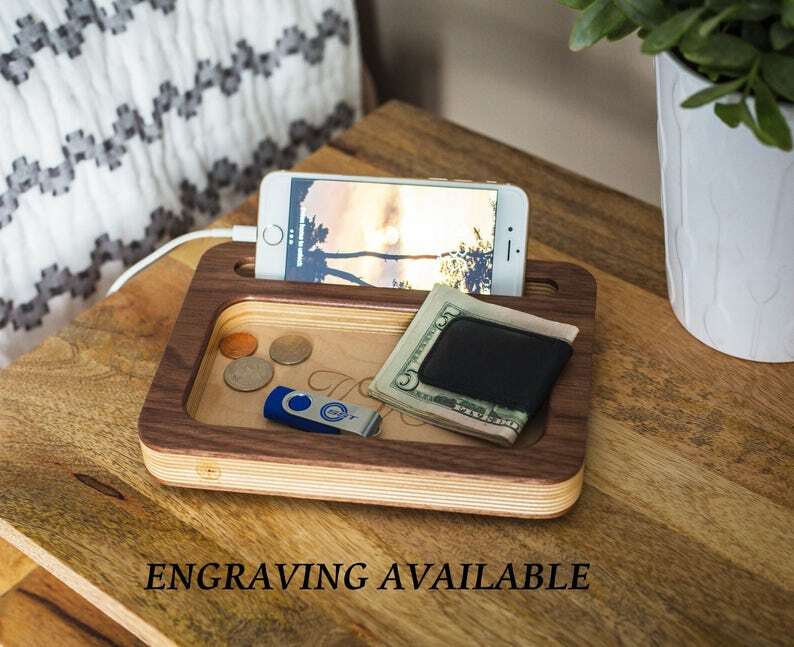 It has a place for keys, jewelry, watches, glasses, change, money clip, wallet and a place to charge his phone. With our one of a kind port design you can very easily and quickly dock and undock your phone. Like all of our products, it is constructed 100% here in the U.S.A. using PREMIUM WALNUT and birch. With a little help from the Amish we handcraft each piece right here in our shop in south central Pa. Each piece is sanded to a super smooth finish and then finished with a lacquer finish that will last for decades to come. This makes a great unique gift to help him get organized. This universal docking station has been designed to be compatible with ALL smartphones, including the IPhone 5, 5s, and 5c, 6, 6 Plus, 6S, 6S Plus, 7, 7 plus 8, 8 plus IPhone X and Samsung galaxy S4, S5, S6, S7, S8 and it also works the cases for these phones. To ORDER simply select the type of wood you would like, personalized or not, and when you check out tell me exactly what you want engraved and the font type in the note to sellers box. To RUSH YOUR ORDER CLICK ON THIS ADD http://etsy.me/2f5DcuR AFTER MAKING YOUR PURCHASE. - Large catch-all organizing tray for your things. - This docking station is travel friendly, it lays flat and can easily be stored or packed. - Finished with several coats of lacquer to bring out the wood’s rich grain and shine. - Rubber feet to hold it secure where ever it sits. - L 8" x W 6." x H1." **Please Note- Wood is a natural material so color variations and grain patterns might vary slightly. Because of the specific materials we use expansion and contraction are minimized. This ensures that our product will last for decades to come. We hand select all of our pieces to ensure we our delivering the best quality product that will last. Each docking station is a one of a kind and may be slightly different in color, grain pattern, and knots than the one pictured. The wood we use often has intensely dark grains and beautiful heartwood coloring. It often contains numerous dark to light colorings giving the grains a beautiful flow and pattern. Night Stand Organizer, Charging station, MENS PERSONALIZED, Gifts for Men, Gifts For Him, Iphone docking station, Boyfriend Gift ideas. Mens Gift, Charging Station, Mens Valet, boyfriend gift ideas, fathers day gifts, Mens Desk Organizer, gifts for men, Iphone accessories, . Charging Station, Charging Dock, personalized, Docking Station, gifts for men, gift for boyfriend, gift ideas for men, boyfriend gifts. Very fast service. Quality craftsmanship. Boyfriend gift, Mens birthday gift, Gift for him, Gift for men, Gift for husband, Gift for dad, Birthday gifts, Docking station, mens gift.